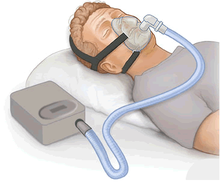 ^ “Complex sleep apnea syndrome: is it a unique clinical syndrome?”. Sleep 29 (9): 1203–9. (September 2006). PMID 17040008. http://www.journalsleep.org/ViewAbstract.aspx?pid=26630 (9 4, 2006). ^ Carley, David W; Prasad, Bharati; Reid, Kathryn J; et al. (2018). “Pharmacotherapy of Apnea by Cannabimimetic Enhancement, the PACE Clinical Trial: Effects of Dronabinol in Obstructive Sleep Apnea”. Sleep 41 (1). doi:10.1093/sleep/zsx184. PMID 29121334. https://doi.org/10.1093/sleep/zsx184.